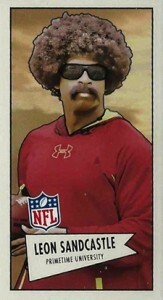 With the arrival of the first few 2013 football card products, collectors are starting to speculate on who's going to breakout. Will it be Geno Smith? E.J. Manuel? Eddie Lacey? But some of the biggest buzz in these early products is coming from a player that doesn't exist. Leon Sandcastle cards are trading well as collectors chase the quirky sensation in products from both Panini and Topps. 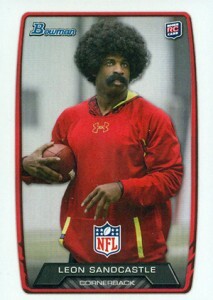 Shop for Leon Sandcastle cards on eBay. 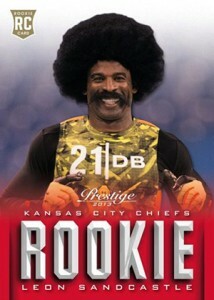 Leon Sandcastle is the alter ego of Hall of Famer Deion Sanders. The character was created to promote the 2013 NFL Draft. After debuting at the Super Bowl, Sandcastle appeared in several vignettes. It didn't take long for Leon Sandcastle to become a viral sensation. Some might say that he even created more buzz than a lot of the draft picks. Panini and Topps both produced Leon Sandcastle cards for their first sets of the season, usually as short prints. The first was 2013 Score Football. He has a "rookie card" that's done in the same green 1989 Score-inspired design as the other rookies in the set. Besides the basic short print, there are four parallels. Red cards are available only in Target retail packs. Blue-border cards are exclusive to WalMart. Purple and Black parallels are in hobby packs. 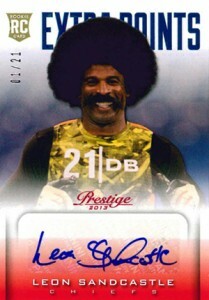 Panini also has Leon Sandcastle cards in 2013 Prestige Football. His cards, #301, is a short print. There is also an autographed version that is numbered to 21. 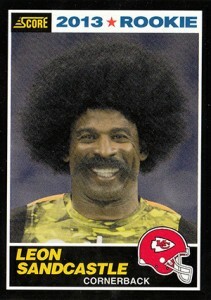 Collectors can find two different Leon Sandcastle cards in 2013 Bowman Football. He has a base set short print as well as a 1952 Bowman Mini card. 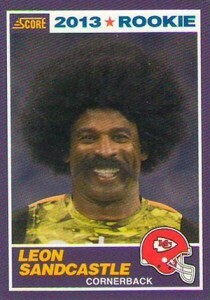 Check out all of the Leon Sandcastle cards below. Shop for singles on eBay by clicking on the card name or image. 2013 Score Walmart Exclusive Blue Parallel Rookie Set Including Leon Sandcastle!